Tag Archive | "power outage"
Few of us ever pause to consider how pervasive an influence is electricity in our lives; until that is, we find ourselves without it. 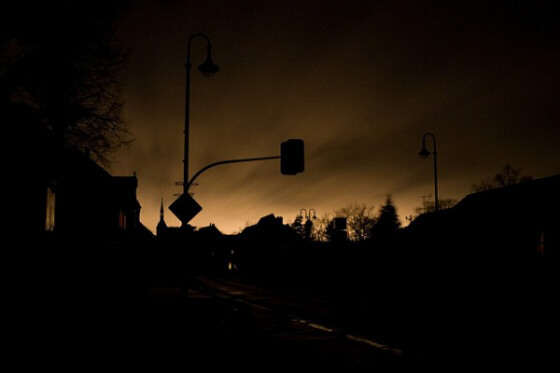 In the past two years, however, many of us in New Jersey have had a glimpse of what life without electricity is like. In 2011, I personally had no electric power at my residence for five days as a result of Hurricane Irene and for six days following the freak late October snowstorm that blanketed the central and northern parts of the state. And, as I am writing this, I am already beginning day three without power in the aftermath of Hurricane Sandy. Regardless the duration of the power outage at my home, Hurricane Sandy has already proven worse in the particular area of the state in which I reside than either of the other respective storms. The reason is simply the geographic configuration of the towns without electrical service. Not only is my home without power, my office on heavily traveled Route 22 is also dark, as is an extended length of that highway from Bridgwater in the west to at least Westfield in the east. With traffic signals not functioning, the authorities have blocked all the intersections crossing the highway, divided like many with a median strip. This means that to cross the roadway, one must do so only at bridge crossings that are relatively few and far between. As a result, the traffic approaching those crossings on both the highway and side feeder roads is bumper-to-bumper, making an ordinary ten-minute trip from my home to my office an hour long agony. With power out, service stations are unable to pump gasoline. This means that the few stations that are open have lines awaiting gas reminiscent of the days of odd-even gas rationing during the Carter Administration (for those of you who are old enough to remember). And, of course, without power, telephone (other than cellular) and cable television and Internet services are interrupted. Living under these conditions is almost like going back in time to conditions of more than a century ago. “Almost,” however, is the operative word. Most of us today have automobiles that, assuming we have gasoline to operate them, enable us to set out like a latter day Columbus on a quest to find life’s necessities in the forms of food and fuel in areas that may still have electrical power. But, also like Columbus, we find ourselves taking strange and circuitous routes due to roads impassable because of fallen trees, flooding, or municipal decree. Most of us also have cell phones enabling us to continue communicating with others when signal strength and battery life permit. And, many of us following Irene and last October’s snowstorm surprise are better prepared, having purchased generators to permit us to continue our home lives with some degree of normalcy. Yet, for someone who is accustomed to living in close proximity to numerous service stations, supermarkets, and restaurants of every kind imaginable, life without power in the aftermath of a natural disaster is quite a shock. For one thing, nothing comes easily. Travel is difficult and competition for food and fuel is high. Lines are long for just about any purchase and waiting is the order of the day. And, the drone of generators is a constant reminder that everyday life has changed and not for the better. Despite numerous reports of selflessness and even heroism in helping others, the predominant feeling that one gets in this type of emergency is that it is “every man for himself.” Lacking contact via typical sources of information including television and the Internet, one feels isolated and removed from society. No matter what and how much planning is done, it always appears inadequate in the face of disaster. Municipalities should have agreements with local landscapers to ensure that fallen trees obstructing roadways are promptly cleared permitting normal traffic flow. Utility companies, for economic reasons, can never be prepared to respond effectively to a widespread disaster. Maintaining the resources necessary to restore power quickly is far too costly to permit profitable utility company operations. Service stations should be required to have generator backup permitting the dispensing of fuel in the event of a power outage. Traffic signals should also have some form of power (perhaps, solar) independent of the power grid enabling them to continue operation when the grid goes down. Municipalities and first responders need to be particularly cognizant of the needs of senior citizens in the event of disaster. Many senior citizens rely on electricity for oxygen therapy and other medical requirements. Most senior citizen housing – whether apartments or communities of single-family homes do not have backup power available and often are forgotten in the aftermath of a natural disaster. Doctors – even those whose offices are without power – should make personal contact information available to pharmacies and hospitals to ensure that their patients have access to needed medications during and in the aftermath of natural disasters. It is entirely understandable that government and law enforcement officials, utility company management and employees, first responders, doctors, and others on whom the public relies during emergencies have their own personal lives, property, family, and other concerns during such trying times. Yet, it is incumbent upon all of these individuals, by virtue of their positions and oaths, to put personal concerns aside and provide selfless service to the public during times of natural disaster. Otherwise, who knows what manner of chaos and lawlessness will ensue when the power goes out?